Like most industries, journalism is constantly bombarded with buzzwords and the latest trends. Editors from across the world will be heading to Austin, Texas, next week for the annual gathering of the American Society of News Editors and the Online News Association conferences. Reader engagement will almost certainly be one of the biggest topics at both conventions. I was supposed to go, but I forgot to look at the calendar before I booked the trip, which would have reminded me that those annual word nerd conferences are happening the same time as the Spokane County Interstate Fair. Besides, we define reader engagement a little differently at The Spokesman-Review than most other newspapers do in 2018. For most in the media, reader engagement means “likes” on the Facebook or retweets on the Twitter, or how quickly your email list is growing. Our definition of reader engagement is a little more 1918. For us, it means hanging out with our readers in real life, having real-life conversations – possibly while we share a tasty beverage or maybe a delicious baked good. Or both. One of the coolest parts of our popular Northwest Passages book club and community forum series is hanging out with our friends who read the paper. So that’s what we’re going to do at this year’s fair. Our newsroom has now spent way more than “A Year in the Fields” as we’ve told the stories of the Washington farmer, and we want to talk with more folks involved with our state’s agriculture scene. A county fair is a logical place to have those discussions. So why not ask our friends to be a part of all of those conversations? As we talked about what we could do at the fair, the ideas got bigger and bigger, until finally we had our own stage and a daily lineup of cool conversations planned. First thing first, you’re going to need to find our stage and our big display that helps showcase the things we learned about Washington agriculture over the past 18 months. 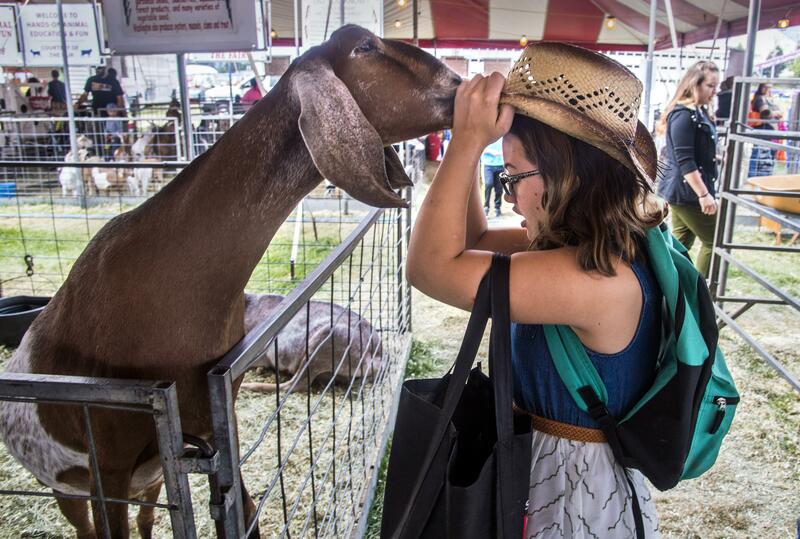 Here’s a big hint: Go to where all of the farm animals and 4-Hers are. If you know where the huge pumpkins are, then you’re even closer. We will be in the Grange building. This Friday, we’ll kick things off with a fun conversation with Spokesman-Review columnist Paul Turner, who will talk about what it’s been like documenting life in Spokane for nearly 30 years. One of the questions we get asked a lot is how we decide what will be on our front page each day. That happens in our daily news meeting, and at 2:30 p.m. Friday, all of our top editors will hold that very meeting at the fair. You’ll see everything that goes into picking the stories that will run in the next day’s newspaper. Afterward, there will be a Q&A with the editors. Then at 4 p.m., our newspaper’s amazing artist Molly Quinn and our uber-talented front-page designer Chris Soprych will talk about how they put together the distinctive look of The Spokesman-Review. When that session is over, you’ll be able to watch Chris design the next day’s front page. And all of that’s just on the first day of the fair. On Saturday at 1 p.m., I’ll have a sit-down with Spokane County Sheriff Ozzie Knezovich that will include lots of questions from our audience. At 4, there will be a fun presentation that looks at the history of newspapers in movies. Spokesman-Review photographer Jesse Tinsley will give you tips on how to take great photos at the fair … even on a phone. Our sports writers will spill all the latest scoops and answer all your questions about the Cougs and Zags. Government editor Jonathan Brunt will host multiple candidate forums throughout the fair, and I’ll have a conversation with Spokane Mayor David Condon on Sept. 16, at 1 p.m.
We’ll sit down with the Top Chef next door, Spokane’s Chad White, as he talks about what it was like to be on TV’s most-popular cooking contest. There are a number of sessions with our newspaper’s award-winning photo staff that you won’t want to miss. But back to the main reason we are there: Talking with our state’s agriculture experts. On Monday, Spokesman-Review Metro Editor John Stucke will talk apples with Jon DeVaney of the Washington State Tree Fruit Association. On Tuesday, Stucke will lead a livestock forum with Debbie and Mark Wiesler of Flying W Farms. On Wednesday, Spokesman-Review senior reporter Thomas Clouse will have a conversation with the Washington Grain Commission’s Scott Yates about the state of Washington wheat around the world. Then, on Sept. 14, we’ll have a conversation about agricultural gardening with S-R correspondent Pat Munts. Plus, we’ll have a few surprise sessions that we’ll announce a little later. Spoiler alert: They’re biggies. For those who have been to Northwest Passages events, you know we love giving out prizes. Our daily prizes at the fair are going to be something you really want. Each day, we’ll be handing out a limited number of 12- by 18-inch prints of breathtaking photos from our “Year in the Fields” series. The only way to get the prints is to attend one of our daily sessions. You see what I mean? This is what real “reader engagement” looks like. Keep your Snapchat. We’re going to have real chats.